This first aid safety sign is there to highlight when a first aid box has been removed and not replaced. It simply fits on the wall allowing you to attach a first aid box to it. The "missing" wording becomes visible when the first aid box has been removed. Under the Health and Safety (First Aid) Regulations 1981 (as amended 1997) employers have a legal obligation to assess and introduce first aid provisions. Any such provisions should be easy to locate. Use our First Aid EasiFix projecting sign to clearly identify the location of first aid equipment from several view points. EasiFix projector signs are manufactured ready to install, with concealed fi.. The pages in this A4 accident report book (50 individual records) are perforated, enabling an accident / incident relating to any employee to be easily recorded, removed and stored securely in your em.. 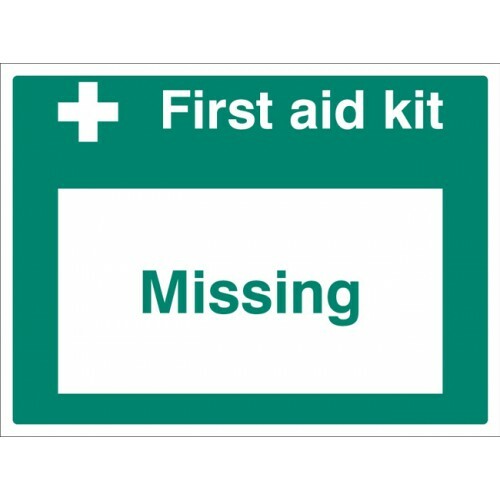 These easy-break labels have been designed to clearly identify when/if a first aid box has been opened. This help ensure that first aid boxes remain fully stocked Miscellaneous Products / MaterialsAn..